I believe life is fluid. I believe there is purpose. I believe in a higher power. I believe we choose our lessons. Even if I don't always understand. Over me.. I believe.. ohh, I believe. Eternity.. I believe.. ohh, I believe. Cuz I believe.. ohh, I believe.. I feel you, come back again..
Over the weekend, a childhood "mom" of mine died. I met her daughter in the 6th grade and we became fast friends. Do I have to explain the significance of the relationship? I'm betting you know exactly what I'm talking about. The deaths this year are adding up too quickly. I hope you remember to dance. And sing. And smile. And love. May the true meaning of Memorial Day resonate within you. I'm out here on the front lines, so sleep in peace tonight. I once had a psychic look at me and say "you're the strongest person I've ever met. Everything you've been through would crumble most people." I get stuck sometimes, looking for the "why." Then I remember everything I've taught myself and walk on. A friend posted a nice sentiment on my Facebook wall which included the phrase "keep the faith" in it. I didn't want to do a repeat of that song so soon since I repeated Bounce yesterday. Now that the initial shock is over, I'm trucking forward. It might take some time for me to adjust to this one. Ironically, the First Agreement in Toltec Wisdom comes to mind: Be Impeccable with Your Word. I'm going to add to that: sometimes, even when you think you're being impeccable with your word, the context and concept can be stripped away, giving your words a very different meaning. Sometimes the person you're speaking of is in a place that assumes the worst. When that happens, you can lose lifelong friends. If I played this EVERY time it has applied, I'd play it damn near every day. I don't even want to say what I'm really thinking, but I should have known this would happen, right? When will the cycle end? Yep. 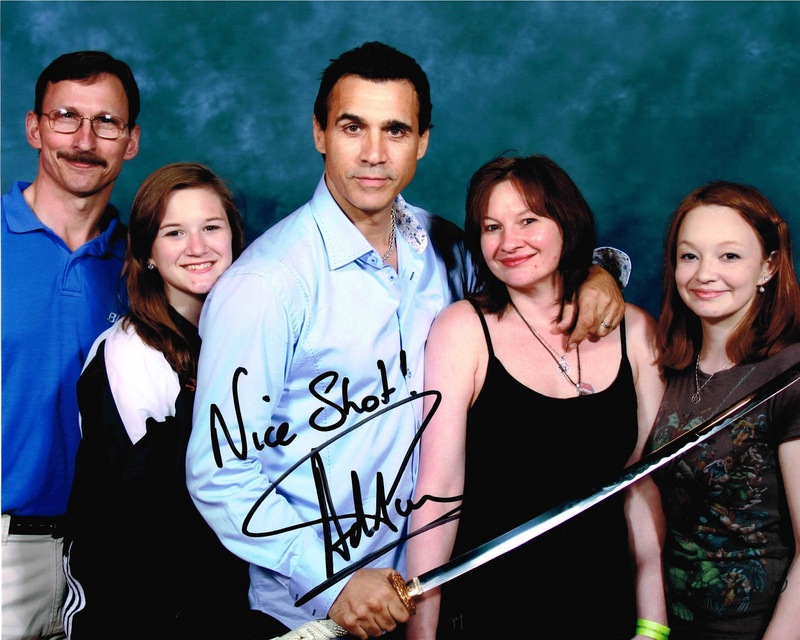 I've done this one before, but having met and been photographed with Adrian Paul yesterday, it had to be my song today. Here are some photos from our amazing day at Motor City Comic Con 2013 in Novi, Michigan. Some of the stars were set up to do professional photo ops. Yes, we had our pic taken with Adrian Paul and received this awesome 8x10 photo. Then, of course, we took it back over to his booth for him to sign it. Our first stop of the day, though, was to see Cary Elwes. He was awesome. Both of the girls got hugs from him. Katana with Batman and Bane. Nicholas Brendon is a favorite from Buffy the Vampire Slayer. But I also love him as the nerdy sometimes love-interest of Penelope Garcia on Criminal Minds. Steve was calm, cool and collected about meeting Edward James Olmos. He even indicated that he didn't need to get a photo with him...until we met him. this was Steve's fan moment. He really loved the Battlestar Gallactica series and admires Edward James Olmos' skills. Even the Muppets showed up! Yes, the girls were geeked to get a pic with Darth Vader. This was a pretty cool moment because I've had a Twitter conversation with Robert Duncan McNeill. We weren't in agreement on the political discussion we were having, but it was a discussion. Not an argument. Not a claws out, distressed conversation. A nice, respectful discussion. He double-triple-quadruple made my day!! This is a pic that was taken when we first stopped at his booth (so into telling him my stories that I didn't notice his assistant take this pic). When we went back to have him sign the pic that we're all in, I asked him if I could have a hug. And he said yes! I have never felt like such a fan girl as I did around him. I was very concerned that my heart was going to beat out of my chest when he hugged me. A lot of people get sad or depressed when it rains. I find it very cleansing and refreshing. The last several years feel like a life-review for me. I have "run into" and "reconnected" with many people that I had broken ties with. People that I had "wronged" in the past or those that "wronged" me have been creeping back into my life. For the record, I think there are about 3 left that I anticipate hearing from. Soon. Seriously. It has been an extremely emotional time for me. It has also been an extremely healing time for me. And a love-filled time for me. I have had an especially difficult year so far. I have been challenged emotionally and spiritually. I have been crushed by negativity and almost defeated. I have almost given up on many occasions. I have also been blessed with unexpected, out-of-the-blue comments and compliments from friends at the least expecting moments. Those moments helped pull me through because I didn't solicit them. Simple statements were made. It was a lot like being slapped in the face with a ray of sunshine on an otherwise dreary day. For that, I am thankful. Love and Light. The point of this song? I haven't forgotten any love. I never will. When the pain heals, all that's left is love. "Don't Forget Me (When I'm Gone)"
I believe in a Universal plan. I believe I will get it right this time. I believe that love is all that really matters. "When The Lights Go Down"
Some things just don't last. I can't get this song out of my head today. I was having such an amazing high from yesterday: Michael J. 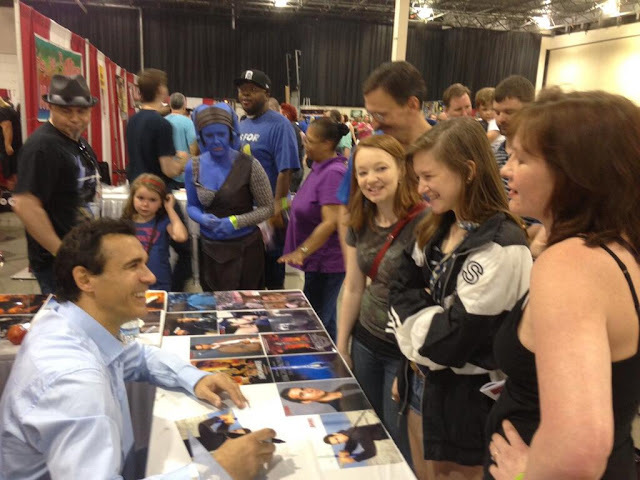 Fox will have a new show in the fall that will actually USE his Parkinson's as part of the story line; I found out that Comic Con will be in Novi this weekend and we bought tickets so I'll get to meet Adrian Paul after 20 years of loving him; I won tickets to see the new Star Trek movie in theaters this weekend; Katana and some classmates performed a two hour showcase of improv, skits and song; Vicky and her family will be joining us for Comic Con this weekend; I also managed a chakra clearing meditation without a recorded guide. I don't understand why anyone who claims to care for me would want to blemish that happiness. 2013 will be a year of great change. I believe that staying in an unhealthy relationship can go a long way to creating physical health problems. Depression. Fatigue. Weight problems (too much and too little). I remember being judged during both of my divorces: what about the kids, they asked. I got it right. Staying in a bad or unloving marriage teaches our children that they have to suffer through that instead of striving to be happy. That doesn't mean you give up easy. It just means you have to know when it's time to walk away. This is for my mom, my aunts, my grandmothers, my sisters, and my girlfriends. Wishing all the mothers in the world a wonderful day focused on you...relaxing, in any way you see fit. Josh Gracin is Westland, Michigan born and bred. I hear him sing and it's sometimes hard for me to match the voice with the baby-face. This song is from his first album. It's another pick-me-up song that reminds me to live. We're going to share a beautiful dream together--a dream that you will love to have all of the time. In this dream you are in the middle of a beautiful, warm sunny day. You hear the birds, the wind, and a little river. You walk toward the river. At the edge of the river is an old man in meditation, and you see that out of his head comes a beautiful light of different colors. You try not to bother him, but he notices your presence and opens is eyes. He has the kind of eyes that are full of love and a big smile. You ask him how he is able to radiate all that beautiful light. You ask him if he can teach you to do what he is doing. He replies that many, many, years ago he asked the same question of his teacher. The old man begins to tell you a story: "My teacher opened his chest and took out his heart, and he took a beautiful flame from his heart. Then he opened my chest, opened my heart, and he put that little flame inside it. He put my heart back in my chest, and as soon as my heart was inside me, I felt intense love, because the flame he put in my heart was his own love. "That flame grew in my heart ad became a big, big fire--a fire that doesn't burn, but purifies everything that it touches. And that fire touched each one of the cells of my body, and the cells of my body loved me back. I became one with my body, but my love grew even more. That fire touched every emotion of my mind, and all the emotions transformed into a strong and intense love. And I loved myself, completely and unconditionally. "But the fire kept burning and I had the need to share my love. I decided to put a little piece of my love in every tree, and the trees loved me back, and I became one with the trees, but my love did not stop, it grew more. I put a piece of love in every flower, in the grass, in the earth and they loved me back, and we became one. And my love grew more and more to love every animal in the world. They responded to my love and they loved me back, and we became one. But my love kept growing and growing. "I put a piece of my love in every crystal, in every stone in the ground, in the dirt, in the metals, and they loved me back, and I became one with the earth. And then I decided to put my love in the water, in the oceans, in the rivers, in the rain, in the snow. And they loved me back and we became one. And still my love grew more and more. I decided to give my love to the air, to the wind. I felt a strong communion with the earth, with the wind, with the oceans, with nature, and my love grew and grew. "I turned my head to the sky, to the sun, to the stars, and put a little piece of my love in every start, in the moon, in the sun, and they loved me back. And I became one with the moon and the sun and the stars, and my love kept growing and growing. And I put a little piece of my love in every human, and I became one with the whole of humanity. Wherever I go, whomever I meet, I see myself in their eyes, because I am a part of everything, because I love." Thank you, Creator of the Universe, for the gift of life you have given me. Thank you for giving me everything that I have ever truly needed. Thank you for the opportunity to experience this beautiful body and this wonderful mind. Thank you for living inside me with all your love, with your pure and boundless spirit, with your warm and radiant light. Thank you for using my words, for using my eyes, for using my heart to share your love wherever I go. I love you just the way you are, and because I am your creation, I love myself just the way I am. Help me to keep the love and the peace in my heart and to make that love a new way of life, that I may live in love the rest of my life. Amen. It is almost impossible to find an original Garth song on YouTube. And I mean "original" in that HE is the one singing it. I miss new albums from him. This song has always been a go to song when I need a reminder to keep plugging along. I'm not feeling that way. I'm feeling more along the lines of The Dance but I couldn't find a good video with him actually singing it. I have struggled a lot this year. I have been thrown into situations that have shaken the foundation upon which I have built me. I have had statements made and actions against me that caused me to feel shame about what I've been through to get to where I am. I have doubted my own sanity. My own worth. But today, this Blessed New Moon energy with accompanying Solar Eclipse, I'm proclaiming the resurgence of me. You can join me on the river or simply wave when I pass by. It's recycle day at ProTech Computers. It's a New Moon. It's a Solar Eclipse. And I am looking forward to getting my garden started this weekend!! I have been focusing on this. I have been consistently practicing personal affirmations and striving to be the change in the world that I want to see. That means, I'm striving more and more to speak with love than with my fears or hurts or angers. Ever mindful of what I'm sending out. I have also been utilizing The Faeries' Oracle cards I received from my sister many years ago. I don't think of specific aspects of my life when I shuffle and draw a card. I look for general ideas about this moment in my life. Last night, I drew: Gloominous Doom. Frightening sounding card, isn't it? One of the first lines in the description of the card was that I should read about the card preceding it because they tend to go hand in hand: The Soul Shrinker. The Soul Shrinker observes what we say to others, especially the mean, nasty, unnecessary and critical things we say and reflects them back to us. And less than 30 minutes later I was pulled into a discussion that could have turned so easily and quickly into a mean, nasty, blame-filled, accusation-fest. Sometimes, you just have to turn around and walk the other way. My path is mine. My life has been spent claiming my path and walking it with confidence. I could have let my hurt and anger take control. I could have spewed nasty, non-productive, negativity on this person. Being impeccable with my word and wanting to be a part of the change rather than the status quo had me pressing the delete button on the response I had typed. Gloominous Doom, by the way, speaks to our self-pity and self-destructive behaviors. Gloominous Doom helps us explore those thoughts and behaviors that perpetuate our personal pity parties. Gloominous Doom wants us to take responsibility for ourselves. I love this sentence: The sorrier we feel for ourselves, the worse our life becomes. I spent about three months of this year in (what I would call) extremely close contact with Gloominous Doom. I am blessed enough that I have the strength and the fortitude to have pulled myself out of it. I'm back. I'm continually working on making myself even better. Continuing to strive beyond the (current) norm. Love is the answer, regardless of the question. Bright, sunny, beautiful days always put me in a mood. I recently read The Four Agreements by don Miguel Ruiz and am striving to live the agreements more mindfully now. You'll probably read more here as I continue to work on creating these realities in my life. I am in a comtemplative mood. This song meant much to me then. It still does...with so many more experiences to support it. Jackson has this little bar/club/venue called The Foundry. Last night, they had a show that included a total of six bands. My brother-in-law's band, Cyk Cylinder, performed. 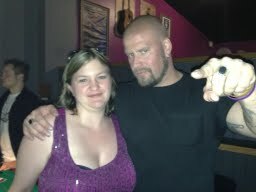 So did Saving Abel. It was supposed to be an all-acoustic show. Some bands didn't get that memo. Yep, my ears were ringing at the end of the night. And really? How can you complain about being less than 5 feet from the stage? I had to be a responsible adult, though, and left just after the set finished. It's a shame because Saving Abel stuck around and mingled. My sister had her picture taken with the guitarist. I won’t sit here and be silent.